Kenneth Jackson was born February 15, 1962 in Neptune and grew up in South River. A tremendous all-around athlete, he starred in local youth league sports and became a varsity standout in four sports at South River High School. Kenny’s best sport was football. He was a wiry, swift and sure-handed receiver for the Rams, and was heavily recruited starting in his junior year. Kenny decided to accept a scholarship from Penn State, a school not know for its passing program. He changed that with 41 catches for 697 yards as a junior in 1982. In 1983, the 6’0” flanker hauled in 28 passes 483 yards. He scored 7 touchdowns in each season, earning All-America recognition both years and become the Nittany Lions’ first All-American receiver. He graduated with more than two dozen school receiving records and helped Penn State win each of the four Bowl games they played in during his years on the varsity—including a Sugar Bowl victory over Georgia for the 1982 national championship. 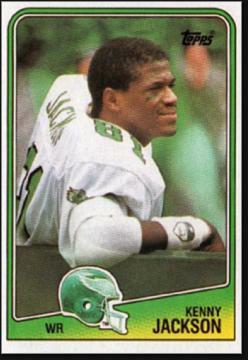 The Philadelphia Eagles picked Kenny 4th overall in the 1984 NFL Draft. Becaue the USFL was bidding for talent at that time, he was able to sign a contract with a $1 million bonus up front and was the Eagles’ highest-paid player as a rookie. Mike Quick, Wilbert Montgomery and John Spagnola were the team’s prime targets that year, but Kenny started more than half the club’s games as a rookie and caught one of the longest TD passes of the year at 83 yards in a won over the Giants. A separated shoulder ended an otherwise promising campaign. Kenny’s 1985 and 1986 seasons were his most productive as a pro. He caught a total of 70 passes for 1,198 yards and 7 touchdowns. Although Kenny was good friends with Randall Cunningham, he was not a favorite of coach Buddy Ryan, After the 1987 season, Kenny lost his passion for football and began focusing more and more attention on a restaurant that he’d opened in Camden (which eventually closed). He played four more years for the Eagles and Oilers, mostly on special teams or as a back-up receiver. Kenny returned to Penn State as a coach on Joe Paterno’s staff from 1993 to 2000. Among the receivers he tutored were Joe Jurevicius and Bobby Engram. In 2001, he joined Bill Cowher’s staff in Pittsburgh and helped the Steelers win two division titles. Kenny got into television a few years later, and v=became a sideline reporter for the Big Ten Network.